Reflections on Photorealism | Skinner Inc. The rise of Pop Art brought representation back into vogue while removing elitism by focusing on images from the media and popular culture. Photorealism took representation to the next level. It is hyperrealism – the antithesis of non-representational art. Photorealists create their works by starting with photographic images which they translate into paintings or prints. The resulting criticism was that these artists were slavishly copying photography, although in fact most used multiple images to create a single composition and routinely move, added, or subtracted elements. At its best Photorealism forces viewers to notice the minutia and beauty of the world around them in even the most mundane subjects. Joyce Stillman-Myers creates Willy Wonka-sized hard candies (Lot 458) and colossal Christmas ornaments (Lot 460) worthy of Santa’s own tree. The subjects can’t help but express joy. At the same time, the real subject in these works is not reflections on joy: it is reflection itself. The surfaces of the ornaments sparkle with myriad highlights and the metallic hanging cords glitter as the kugels sit nested in tissue paper. 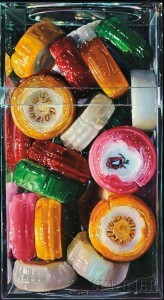 She layers her cut rock hard candies with sheen and reflections as they sit in their clear plastic box, safely protected from anyone tempted to lick the painting. Richard Estes, like Stillman-Myers, focuses on highly reflective, manmade surfaces. Such surfaces are a favorite of Photorealists. Instead of Stillman-Myers’ monumental still life subjects, Estes focuses on real and identifiable places: cafeterias (Lot 65), bus interiors (Lot 66), and city streets. His Holland Hotel (Lot 67) is dominated by shop windows which mirror the buildings on the opposite side of the street. The windows dominate, and in fact the title references the sign and building visible only as a sliver on the extreme left of the composition. Once again, the main focus is reflections, this time in the shop windows which dominate the right side of the composition, and which show the buildings on the left in far greater detail than would otherwise be apparent given their distance from the viewer. 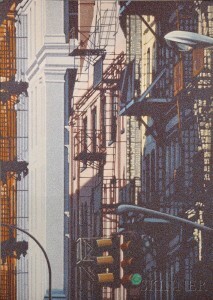 The street itself is hardly scenic, it is 42nd Street seen from 9th Avenue in New York City. At the same time, we’re drawn in by the reflections and the variety of architecture encompassed in this block. Reflection is not the only subject for Photorealists. Michael Zigmond’s Two Tulips (Lot 459) also plays with reflective surfaces, but adds a haptic quality, making us aware of how different surfaces – glass, wood, and petal – feel to the touch. 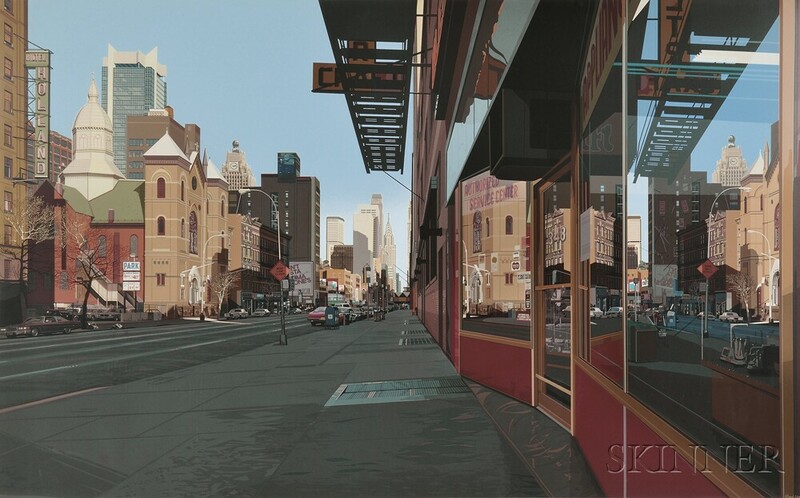 Hsiang-Ning Han tends to focus on cityscapes, much like Richard Estes, but here reflection is not the main focus. Instead works like Street View, Soho (Lot 453) pay homage to the appearance and aging of photographic images. The artist creates a grainy-looking image, the that might be attained by shooting an image using a faster film or from blowing up a small negative to a large scale. Even the palette is adjusted, appearing like that of a gentle aged Ektachrome. The range and variety of this small group of Photorealist works is clearly indicative that Photorealism is anything but servile reproduction.. It is a manipulation of reality that creates nuanced perceptions of the world around us. Our September 23 auctions of prints and paintings feature a group of Photorealist works. We invite you to come and preview these and other Photorealists works on September 21 through 23. [i] Clearly this is not the case, and many Ab Ex painters had traditional training. Jackson Pollock, for instance, studied with Thomas Hart Benton. This entry was posted in Blog and tagged abstract expressionism, art, art auction, boston, boston auction, fine art, Hsiang-Ning Han, Jackson Pollack, Joyce Stillman-Myers, Michael Zigmond, painting, Photorealism, pop art, printmaking, Richard Estes, skinner, skinner auctions by Robin Starr. Bookmark the permalink.